Country Craft's G-8 trellis adds a unique personal touch to any garden or landscape while providing support for climbing flowers and plants. Designed as the perfect support for Trumpetvine, with the whimsical addition of a hummingbird, this practical wooden trellis looks great with or without plants. At over 6 1/2 feet tall this trellis also provides ample space for Clematis, Morning Glory or Climbing Roses to show off their beautiful blooms. 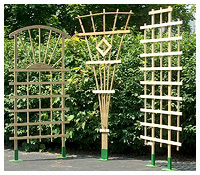 Add a touch of distinction to your backyard with the G-8 trellis from Country Craft.